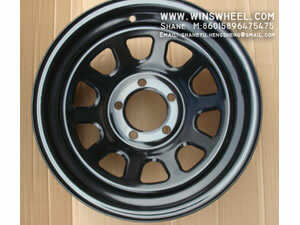 The custom steel wheel rim is also called SUV/jeep steel rim. Refitting wheel mainly depends on the need of our clients. And according to the clients' needs, our research and development team have developed the wheel that are certificated by the International Standard Organization. What's more, in order to enhance the cars' stability in the process of working, we increase the weight of the car body. Our method of final treatment: hot-dip galvanizing, line drawing with black and white, and power spraying. The custom steel wheel rim, or SUV/jeep steel rim, is mainly used in SUV, JEEP, and other kinds of refitting cars. The loading capacity is 1870 pound. Compared with others, our custom steel wheel rim (SUV/jeep steel rim) is various in sizes with stable quality. Besides, it also meets the artistic and decent characters of custom steel rim. Wuxi Hengsheng Wheel Co., Ltd is a leading manufacturer of custom steel wheel rim (SUV/jeep steel rim) in China. Besides custom steel wheel rim (SUV/jeep steel rim), we still supply clients worldwide with many other types of steel wheel rim, including snow steel rim (or winter steel rim), passenger car wheel rim, trailer steel rim (trailer wheel rim), tubeless truck wheel rim (demountable truck rim), mobilehome steel wheel rim, pick-up truck wheel rim, auto wheel rim (steel auto rim), and so on. Featuring unique design and reasonable price, our products have been quite popular among clients from America, Oceania, Middle East and many other countries. Besides, OEM service is also available. If you need custom steel wheel rim (SUV/jeep steel rim), please contact us freely. Auto Wheel RimThe auto wheel rim, also called steel auto rim, is typically used to take the place of the aluninum wheel whose price is much higher than this kind of auto rim. Snow Steel Wheel RimThe snow steel wheel rim is also called winter steel wheel rim. With a solid and durable feature, it is used to substitute for aluminum wheels under a cheap price.